As most medicinal chemists probably know, one of the major challenges in the field currently is to find out the principles that govern the ability of "large" molecules - especially ones violating the famous and often sacrosanct and overused Lipinski's Rule of 5 - to become drugs. Larger molecules like natural products and macrocycles are thought to be much better modulators of protein-protein interactions and therefore considered to be part of the next generation of important drugs. In meeting this challenge a widely agreed-upon obstacle is cell permeability. Because of their large size and exposed polar surface area larger molecules find it much harder to get across lipophilic cell membranes. But nature as usual has thrown many exceptions at us. The quintessential example is the immunosuppresant cyclosporin which is a master of conformational camouflage; in water it opens up to expose its polar groups for optimum solubility while inside a lipophilic membrane it flexes itself and folds up to form intramolecular hydrogen bonds and hide its polar surface area. It thus thrives in both environments. Forming intramolecular hydrogen bonds to enable compact conformations and hide polar surface area is in fact a dominant strategy used by natural products to enable membrane permeability. Not surprisingly this is a highly sought-after strategy in drug design too, especially for larger molecules which otherwise may not get across membranes. Unfortunately for now, it's much easier to retrospectively identify molecules which adopt intramolecular hydrogen-bonded conformations than engineer such interactions prospectively into a potential druglike compound. Nonetheless, it is only through such retrospective studies that we can learn the principles which will someday hopefully allow us to design drugs which can fold to form intramolecular hydrogen bonds on demand. That's why I was pleased to see this study in J. Med. Chem. from a joint academic-industrial group in Sweden. 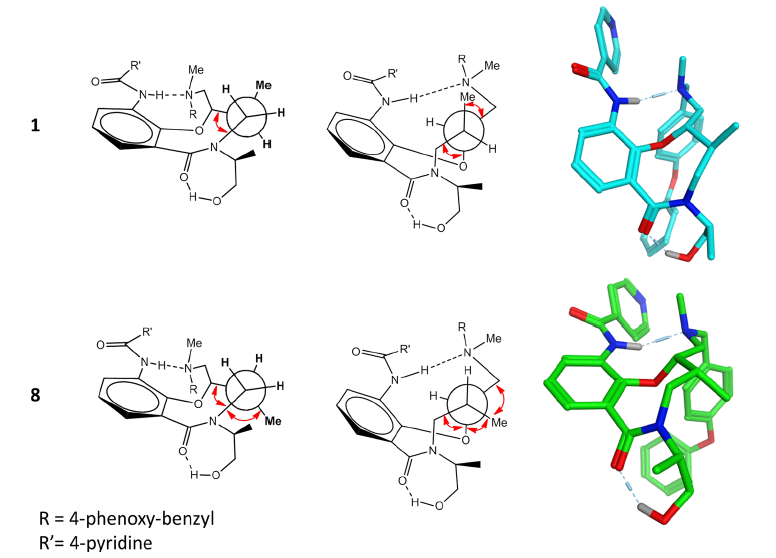 The authors were looking at a subset of molecules from a screening collection at the Broad Institute that exhibited activity against T. cruzi, the parasitic agent that causes sleeping sickness. They had a compound with three chiral centers and one double bond which could be cis or trans. They consistently found out that the cis compounds had better cell permeability at increasing pH values as well as better solubility than the trans. Computational modeling identified a low-energy conformation with a hydrogen bond between an amide NH group and a tertiary amine in its neutral form. This hydrogen bond was present in both conformations but, crucially, it was about 2.6 kcal/mol higher in energy for the cis (8) compound than for the trans (1). In a nutshell it means that the cis compound would prefer not to form that hydrogen bond and instead expose the polar groups to solvent, accounting for its better solubility. The higher energy for the cis compound probably comes from two extra gauche interactions in the hydrogen bonded conformation compared to the similar one for the trans. I always love it when one can invoke principles of basic college organic chemistry and conformational analysis to explain such observations. The calculations were also supported by solvent-dependent NMR studies. The cis compound also had a higher pKa, which could account for its higher permeability at pH values approaching physiological conditions. This would be because with its higher pKa value the cis compound would be deprotonated more than the trans as the pH increased; deprotonated, uncharged species can diffuse better through a hydrophobic membrane. The difference in pKa can also be accounted for by the higher energy of the hydrogen bond; remember that pKa is a thermodynamic variable related to equilibrium constants through the Henderson-Hasselbalch equation. I really like these kinds of studies where an examination of basic chemical properties supported by relatively simple computational calculations can help us rationalize and even predict important druglike properties like solubility and membrane permeability. If nothing else they provide a few more valuable data points on the way to prediction nirvana. Worth a look.